The Germans were as keen as the US and British in mobile troop air defense and came up with a large number of vehicles to provide this necessary support to ground forces units. But of all of their efforts, probably the most striking one of the lot was the mating of a 2cm Flakvierling quad mount and an octagonal turret with rebuilt Pzkw. IV chassis as a very potent tactical weapons system. 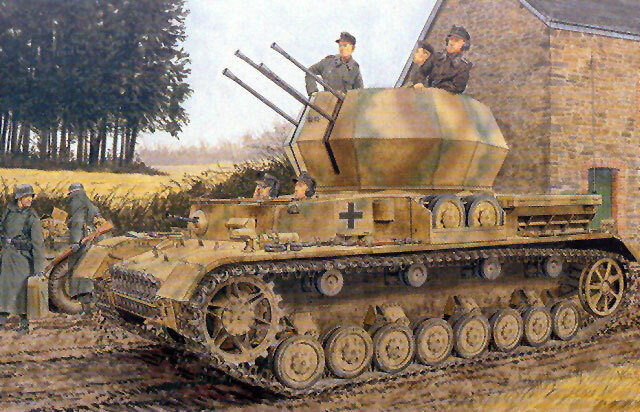 The vehicle, formally designated as the Flakpanzer IV/2cm Vierling, was better known as the “Wirbelwind” (whirlwind). Alas, only 122 of these vehicles were converted between July and November 1944 before they were replaced by the Flakpanzer IV/3.7 cm Flak or “Ostwind”. Monogram first offered a kit of this vehicle in the early 1970s in 1/32 scale, and Tamiya followed with a 1/35 scale kit in the late 1970s. But now DML has released a state-of-the-air variant on their nice Pzkw. IV Ausf. H chassis and it is a very nice package indeed. But the kit does not have any zimmerit, and other than the bare areas on the hull of the Borden one (picked clean by modelers for examples as near as I can figure!) this kit has no zimmerit on it, period. Note that if you do add zimmerit the turret does NOT have any attached as it would add weight and would have slowed it down when traversing, a problem most armored turrets had when tracking enemy air targets. “Brummbaer” kit. Drivers now consist of only four parts; the separate bolts are gone. Bogies are now nine piece affairs without separate tires. New details are provided for the tow hook at the rear of the hull as well. The upper hull again consists of a deck and framework with applique sides, front and rear engine intake components and fenders. The standard muffler has a central tube section and six add-on parts to complete it along with a “slide molded” exhaust pipe. All ports and hatches are separate parts so they can be posed open. Other than the interior of the turret the hull only provides a rudimentary firewall for the engine compartment and the cross-braces and new turret race parts. The bow also comes with a well-done machine gun and ball mount. Note that all ports have clear styrene inserts as well. The turret is unique in that DML split it vertically at the joint between the front five panels and the elongated rear three panels. The upper sections are respectively thin - DML’s “Razor Edge” moldings – and the joint here is easier to hide than the old horizontal splits used by Monogram and Tamiya. The turret race fitting for the upper race is molded as part of the front section, a truly unique design. The 2 cm Flakvierling 38 has new guns with slide molded barrels and flash hiders. As with previous DML antiaircraft gun offerings, there are different sight articulation bars provided for setting the guns at either 0 or 60 degrees elevation, but the guns will not move if the bars are used. A number of magazines and ammo racks for the installation. As with all “Smart Kits” etched brass is kept to a minimum and only covers items such as the engine air intake louvers, the inner guides of the idler wheels, some small brackets, and the flaps for the engine air intakes on the sides of the rear deck. There is also what appears to be a “catch bin” for ammo casings at the bottom of the turret. Tracks are the “Magic Track” snap-together-then-cement type, and modelers are advised to recall that when facing the head card the left side track links are on the left and right are on the right. So far no DS plastic tracks have been provided in any Pzkw. IV kit, but this one provides some extras as well as T-34 track for applique armor protection. Five finishing options are provided along with a targeted set of Cartograf decals: Unidentified Unit, 1944 (tricolor with crosses); Unidentified Unit, Hettenschlag, Alsace-Lorraine 1945, (green and sand under whitewash, black 032); 1st SS Panzer Regiment, 1st SS Panzer Division “LAH”, Stoumount, Belgium 1944 (tricolor with crosses and divisional markings) ; Unidentified Unit, 1945 (tricolor with whitewash patches); Unidentified Unit, Eastern Front 1945 (tricolor with whitewash panels, black 044). Technical assistance was provided by Notger Schlegtendal, Thomas Anderson, Dan Graves, Tom Cockle and Gary Edmundson. Overall, other than the missing zimmerit this kit should be very popular for the great representation of its subject and the most correct depiction of the turret mounting yet.